This is a short ( 1 to 2 hour) walk mainly along a section of Offa’s Dyke Path National Trail, around the middle section of this 175km walk. It is accessible by public transport, courtesy of the Castles Connect bus service (#783) which starts from the Assembly Rooms, Ludlow and continues via a number of small towns and villages (many with castles) to Bishop’s Castle. This bus runs only at weekends (and Bank Holiday Mondays) between April and September. It stops for pickup or set-down on demand, anywhere that is safe to stop. From Ludlow to Five Turnings Farm takes around 50 minutes. About 3km after the bus leaves Knighton, having climbed beside a long wood on the right and open hillside to the left, it leaves the wood behind and about one km later a group of houses and a road junction on the right appear, with two more tracks going off to the left. This is Five Turnings Farm. Get off the bus and go through the gate on the left to take an overgrown green bridleway, to the left of a metalled farm road (labelled private). Sheep had strayed from a nearby field to graze in the long grass amongst foxgloves. The lane emerges into a field. Walk uphill across pasture, blooming with thistles, buttercups and two colours of clover when we were there. Depending on the state of the crop the path may not be clearly defined but head towards a gap between two small woodland plantations at the top of the hill. Beyond these woods, the path is on the flat hill top, between sheep fields with fences and low trees, the trunks and branches of which were festooned with wool from sheep rubbing against them. 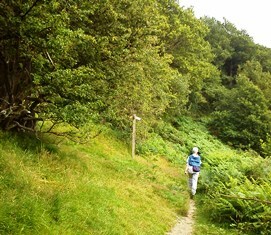 Just as the path begins its decent it meets Offas’s Dyke and the National Trail that follows it. Turn left through a style to follow the earthwork on its western flank along a mainly level route with excellent views up the Teme valley. What impresses about the dyke is not so much its present height since the mound has been weathered down by rain and ploughing to only a metre or so high, with the ditch behind it a similar depth. But it is the realisation that this boundary, man-made, was several metres high, and ran for more than 100 km (the exact extent is disputed). There was plenty of nature doing its bit to wipe out more of the dyke: white tails of rabbits disappearing into burrows in the bank itself as two red kites circled overhead. The recently shorn sheep paid no attention to either or to us. Looking to the right and back a little you can take in stunning views of the steepening hills and narrow valleys receding into Wales. In the foreground is the flat-bottomed valley of the River Teme, meandering across its width while further away the thirteen arched viaduct stands out. This takes the Heart of Wales railway line across a side valley and above the village of Knucklas, right next to a ruined Marcher castle (thought to have been built by the infamous Mortimer family). The path remains at around 350m elevation as it rounds the hill then suddenly begins to descend as the roofs of Knighton come into view, unexpectedly close but far below. A fingerpost shows a right turn to a sharp descent on a short stony section with July bracken at head height on either side of the path. The slippery stones give way to grass underfoot for a steep scramble down into woods before the path meets a road at a gate. Cross over into a field on the far side and follow the path to the railway line. Cross the line with care (though there are only about 4 trains a day in each direction) to a wooden footbridge across the Teme. The path turns left following the river bank through a water meadow. Metal grids in the path stabilise it here and help drainage. On entering another small wood by the river the Offa’s Dyke Trail goes right just after an informal sign showing the Wales-England border. Head up a slope into an open field and ahead a long low building of siltstone and wood. This is the Offa’s Dyke Centre, with lots of displays about what is known of the dyke and its origins. You can also buy ice creams. 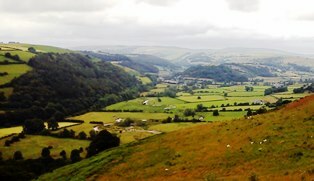 You are now in the heart of Knighton, a small market town straddling the Teme but mainly in Wales. It has a railway station on the Heart of Wales line and also the Spaceguard Centre in a nearby dark sky area, owning the largest telescope in Wales and keeping a watch for near earth objects which might one day wipe us out, just like the dinosaurs. Continue past the visitors centre past the Victorian clock tower into Broad St., turning left into Station Rd. The first turning right, Bowling Green Lane, has the Knighton bus station layby where the #783 bus (and the #738 bus) will return you to Ludlow or other destinations. 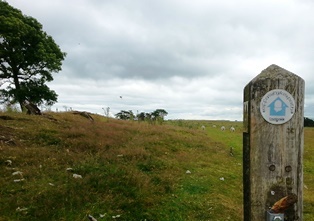 The Offa's Dyke Path is one of the official UK National Trails, running from Chepstow to Prestatyn, is an old fortification/boundary bank and ditch (dating from at least the 8th centurey and possibly older). The total length is just over 285 kilometres (175 miles).